PuzzleMad: OMG! I think I've lost my mojo? Pictured above is the Euro puzzle designed by one of my favourite puzzle designers, Jean-Claude Constantin. It looks so very simple and yet has become my new nemesis causing me to question whether I am losing my puzzling mojo? I had been eyeing up a few of the wire puzzles by Jean-Claude for quite a while and finally bit the bullet and ordered this one quite a long time ago from Puzzle Master. It is designated as a level 9 (Gruelling) puzzle by the guys at Puzzle Master and I figured that at that level and with no string involved at all, it wouldn't be too bad and might in fact be quite a fun one to explore. None of the other level 9 puzzles recently have caused me much difficulty. Oh how wrong I was!! 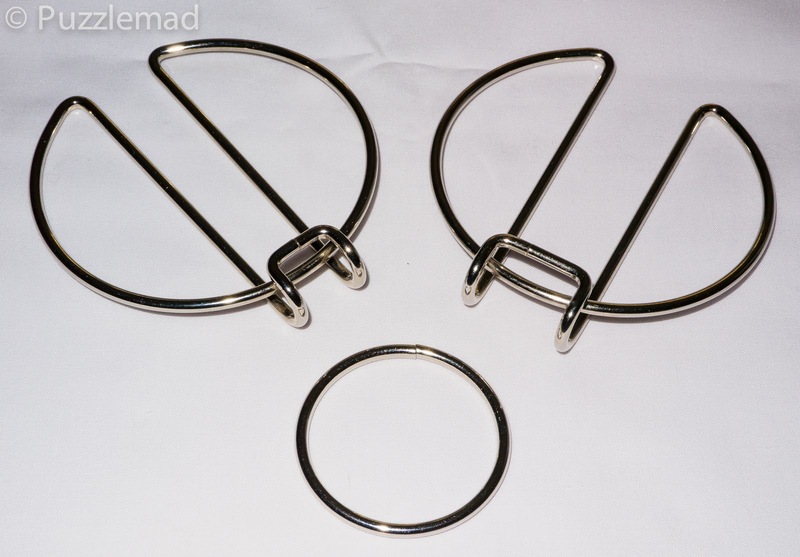 Instructions are to remove the ring from the other 2 pieces (in reality the ring is the first piece to come off - it will actually completely disassemble). No instructions or solution are sent out with the puzzle but if you want to download the solution then it can be found here in Puzzle Master's solution section. Someone has left a 5 star review on the product page but as far as I can tell there have been no descriptive reviews yet. Initial exploration shows that all movements are VERY restricted. In fact there is almost no movement possible at all. After a little while I got up the courage to be a bit more vigorous and using just a tiny little bit of force it is possible to start making a few more moves but really not very many at all. It appeared like other moves should be possible and looked like they would lead to somewhere interesting but every time I tried it, a significant amount of force was required and I backed off! After the first hour or so of fiddling, I gave up and put it in my work bag to carry around with me so I could have a try whenever the possibility arose. Well, it arose reasonably frequently and I spent hours and hours and hours on this blasted puzzle! 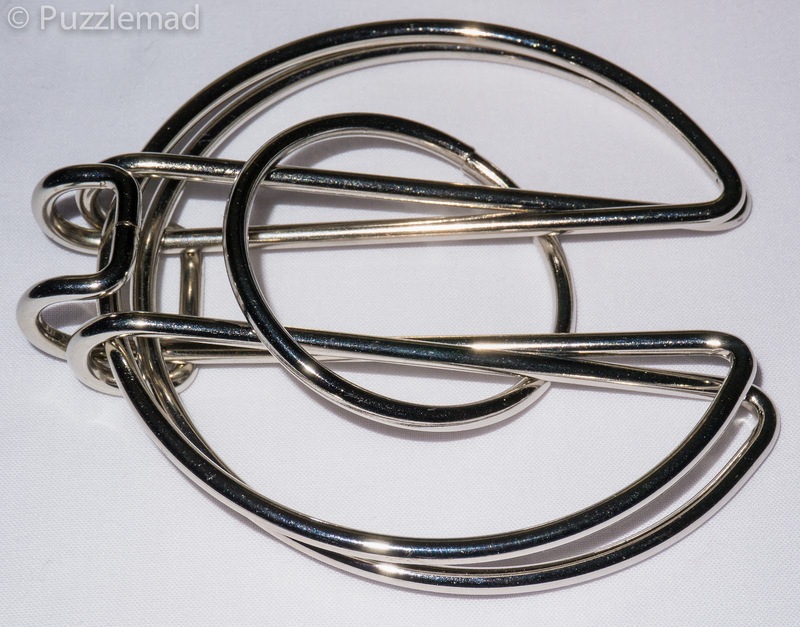 It is a pure wire puzzle with no string at all so how can it be so difficult? I carried it with me for several months with no success at all! I began to think I would never get it and I should just give up and download the solution! But no! I kept at it and recently after a rather complex and definitely not intuitive sequence, the ring popped off into my hand! And from there the other two pieces came apart. 3 pieces - it nearly killed me! Of course, by the time that I got it home, I had forgotten how I had done it! To be perfectly honest, I'm not really certain that I ever really understood what I did! I have tried and tried and tried to put this one back together and have failed miserably! Not only did it take me months to dismantle, but I cannot reassemble it! I am a failure! I have downloaded the solution and it is just a single page pdf with 3 steps on it! OMG! Is it that easy? Hell no! I cannot for the life of me follow those instructions! I have tried for hours and they make no sense to me at all - I certainly didn't disassemble it that way! So I now ask the puzzle community - have you got this puzzle? Can you solve it? More importantly can you help me put it together again? I absolutely hate to put a puzzle away in pieces!!! 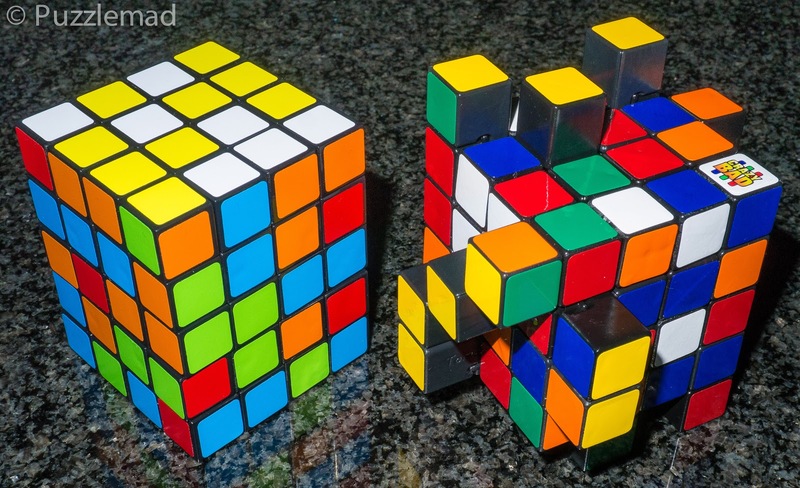 Should you buy this puzzle? Well I have to say that if you want a tremendous challenge (I think it should be rated as a level 10!) then absolutely buy it! It is only $10. If you do buy it then you can gloat at me if you find it easy and please PLEASE tell me how you put it back together! Have I lost my mojo? Maybe I have! 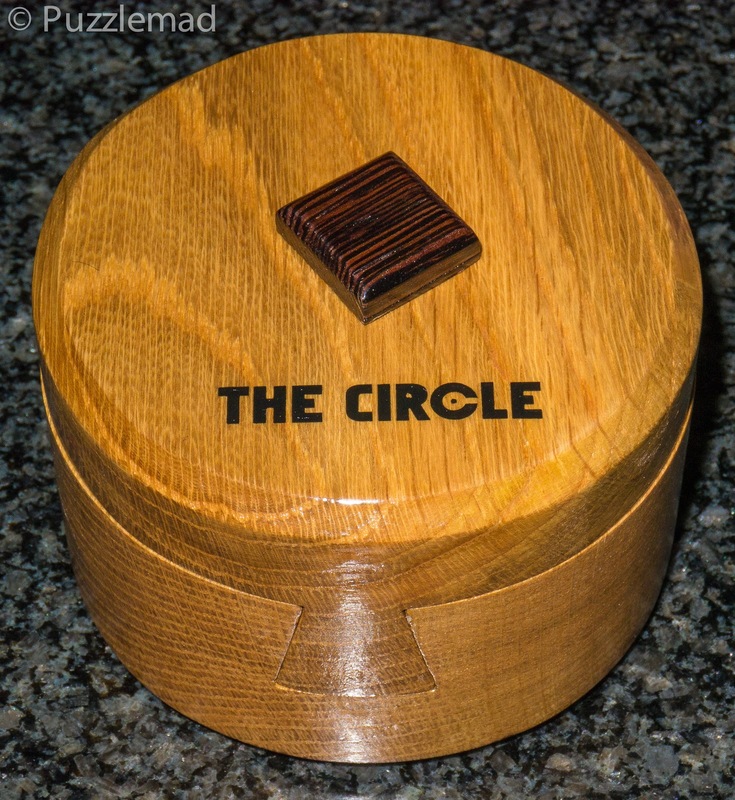 Last week I showed you a preview of Shane's new puzzle, the Circle. I have played with this one every evening for over a week now and have literally only managed to discover the first 2 moves! Shane maintains that it is not that complex but he's more brilliant than he thinks and I am definitely not terribly bright!! I will keep at it but I really hope that all this trouble doesn't indicate that my puzzling abilities have run out!! Is it possible to use up all your puzzling ability? 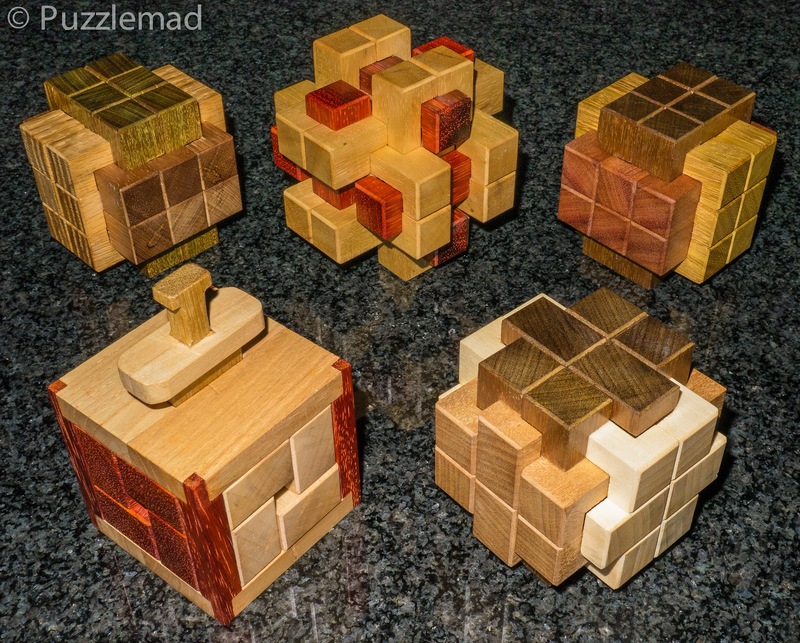 I have just recently received some gorgeous new burr puzzles from Alfons Eyckmans and really hope that I can manage these (sob! sniffle!) - at least if I cannot then they will look gorgeous on display! Front row - Damocles and Bigfoot Charlie. Finally I did decide to test myself this weekend (just to make sure it wasn't completely gone!) 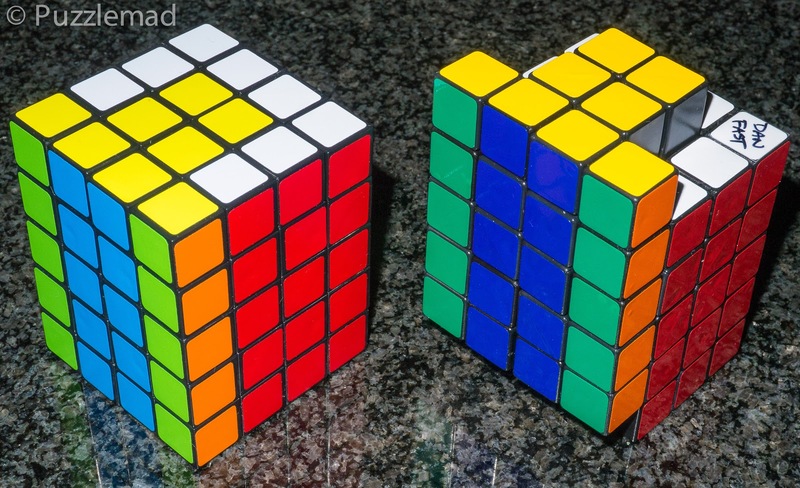 - I received a new cuboid puzzle from Dan Fast (aka CrazyBadCuber). He (and I) had so enjoyed the special puzzles from Calvin's puzzles based on a 3x3x5 core. Our favourite was an offset 3x3x4 puzzle (called the i-334) which has some very peculiar properties. Dan made a tougher version - the offset 4x4x5 cube (i-445). 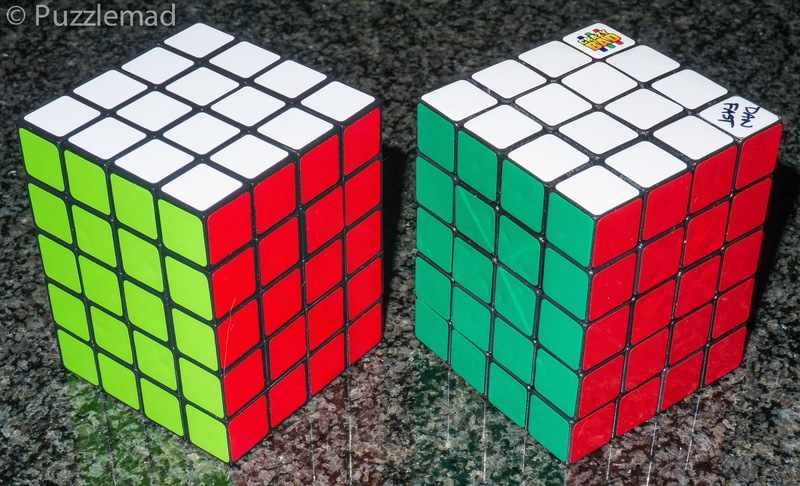 Below are a series with a standard 4x4x5 from Ayi to compare. Just 2 turns and something odd! Luckily for my sanity (what little there is left) I was able to solve Dan's puzzle with only a small amount of difficulty! Phew! Thank goodness for that! Mojo intact! Having put out my plaintive cry for help with the reassembly - my friend Joe was kind enough to send me a whole series of photos showing me how it went back. It was very similar to my disassembly technique but did seem to require just a little more force than I think is correct. Unless anyone can show me how it is possible without force then I will assume that Joe is correct! Thanks so much mate! My initial claim that this was inventin by Jean-Claude Constantin has been shown to be incorrect. The puzzle was actually invented and patented in January 1905 by Charles Saunders of Melrose Massachusets. In the patent he perfectly describes this puzzle which he just names "Puzzle"! Obviously the Euro part has come with the new currency! You can download a copy of US779874 from here! Unfortunately the diagram he includes is pretty much the same as that from Puzzle Master and of no help whatsoever!! Gabriel! I'm relying on you to solve it quickly and prove how dim I am and also you can then teach me to put it back together again. Hmm...losing mojo...reminds me of the Austin Powers movie! That's just where it came from! Hi I am Qingliang Yang from Indonesia. 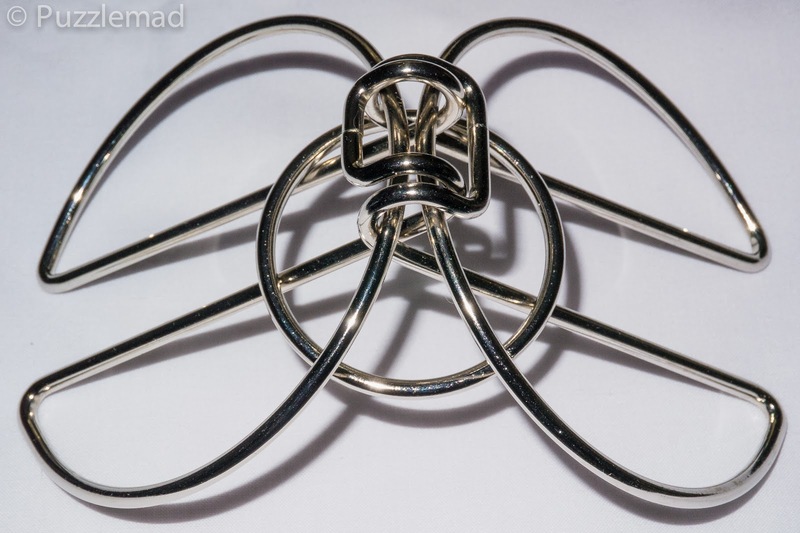 I 've solved this beautiful Wire puzzle. it requires a little force to disassembly and to put it back. Congratulations! I also can do it now but I really struggled with it! Can you please email me or post a youtube video for a detailed solution to this puzzle? I have had it over one year and have relied on not only the puzzlemaster solution but also the patent diagram to no avail. I can't do it via the replies system. Please use my Contact Me page - this will give me your email address and I can send you a photo sequence.